Identification. The Holub's Golden Weaver is a golden yellow weaver, larger and heavier-billed than the Eastern Golden Weaver, and the eye is pale yellow, not red. The sexes are similar but males have an orange wash on the throat and upper breast (photo right) - other sympatric golden weavers have the whole head orange. Juveniles have longer tails than other similar juvenile weavers. Distribution. 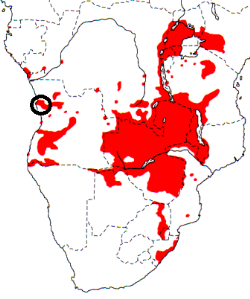 Holub's Golden Weaver is found in Congo, DRC and Angola, and from East Africa south to KwaZulu-Natal, South Africa (see map below, based on Birds of Africa). No large-scale range changes are apparent and no subspecies of the Holub's Golden Weaver are recognised. Habitat. The Holub's Golden Weaver inhabits bushy areas interspersed with tall grass: it likes forest margins, woody savanna and dense vegetation along watercourses and stream lines. 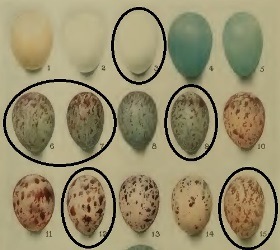 This species occurs mainly singly and in pairs, but may roost in flocks. Anting has been recorded. Food. Holub's Golden Weavers feed on a variety of food including insects, berries, fruits, green and ripe seeds of grasses, seeds and nectar. They extract grubs from pods. Termite alates are caught on the ground or on the wing. Young are fed on spiders and insects like grasshoppers, praying mantises, and tabanid flies. Like many weaver species, the longevity record is over 10 years (see here). Breeding. 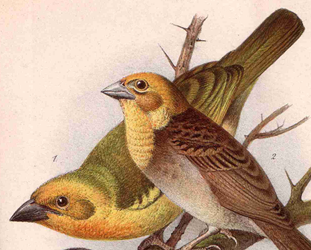 The Holub's Golden Weaver is a territorial, monogamous, semi-colonial nester. Two or three territorial males often breed in a loose colony of 2-5 nests each. The male builds several nests (photo below) but usually only one is used for eggs. 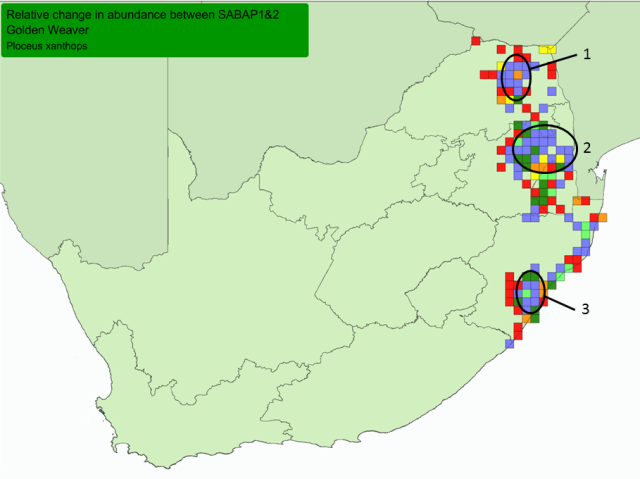 The breeding season is Jan-Apr over much of its range. The nest is a large, bulky, kidney-shaped structure, with no spout but usually with a 'veranda' of seed-heads protruding from the entrance on the underside. The nest is woven of coarse, broad-bladed grass. Breeding nests are lined with grass heads and stems and sometimes a few feathers. The nest is usually suspended from its roof. Sometimes it is slung between reeds or supported at one side by a reed; or placed in tall bushes amongst elephant grass, on drooping tips over water, and in reedbeds. Colony size varies from 1 - 4.3 - 15 (n=19). Nests are mostly built in trees (n=42), but also in reeds (n=4) and mixed sites (n=3). In contrast, a study in Zimbabwe, counted 54 nests in reeds and 43 in trees. Also look out for old nests which may be used by a variety of birds like Orange-breasted Waxbill Amandava subflava, and even by Woodland Mouse Grammomys dolichurus.